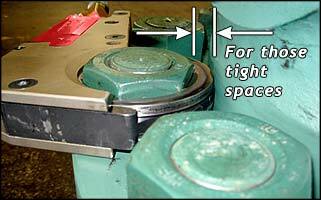 Low Profile Hydraulic-Wrenches are required tooling for limited access applications where clearance is a problem. Plus long bolt applications. Torque range: 346 Nm. up to 43,000Nm. A total Torque Tool hire solution! Our Low Profile Torque Wrenches available with 240 Volt or Air-over-Hydraulic Pumps, 3m hose, &Calibrated Torque-Chart in weatherproof Cases. The Low Profile Torque Wrenches offer the versatility to gain access other TorqueWrenches cannot. 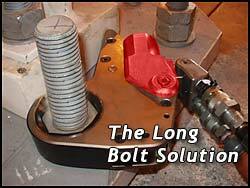 Long Bolts: The only Long Bolt solution for high torque applications. First run-down the thread by hand, put Low Profile Hex Cassette on the bolt just like a Ring Spanner. The Hydraulics do the work, press the Reaction-Pawl to let go of the pressure and removeLow Profile Tool, again just like a Ring Spanner - easy! Tight Access around a nut: wherever limited space is a problem, like close to a housing where even a socket will not fit, the thin minimum radius wall for a Low Profile Hydraulic Torque Tool allows the tool to fit! The Low Profile Hydraulic Hex Cassette Multiplier with such low-clearance Hydraulic models allow many solutions for, pressure pipes and flanges and wherever housings over hang the nut. like the photo on the right, the machine housing gets in the way of any other tool. The Low Profile tool have the limited clearance needed to solve difficult access issues. 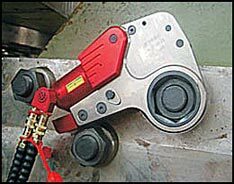 Low Profile Hydraulic Tools are the Limited Clearance specialist: a ring spanner wrapped around a Torque Multiplier. The minimum nose radius that's close to that of impact sockets. 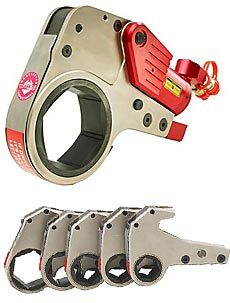 These Tight access torque-tools now allow accurate torque to bolting previously thought impossible. Also see Long (extension) reaction arms too. Video:Pipe Flange being torqued up with a WREN Low Profile Hex Cassette Tool. Although not strictly speaking , a difficult access application, the Hex Cassette tool is not limited just to special difficult applications. PE-55 Hydraulic Wrench Pumps use specific valving to operate Hydraulic Wrench Tools. The Advance Side (via the regulator) operates from 1,500 - 10,000PSI to control the torque output. The auto shift valve regulates the Retract Side to 1,500 PSI. Pumps can be Air or 240 Volt driven. 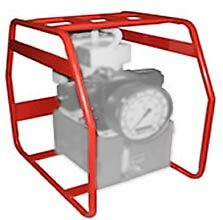 Supplied with chrome frame, Couplers, oil, remote control, 4" Gauge - Ready to go. Available to ensure all tooling remains together and can be transported to site. Tough, lockable lid with 2 reinforced lifting handles. 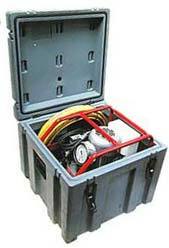 Containers can accommodate the pump, hose set, sockets and tool. Hex "Reducers" are used to create a smaller Hex AF sizes from one cassette link. This expands the size bolts a single Cassette Link can be used on. The standard Low ProfileHydraulic Torque Tool Hex Cassette has a nose radius close to that of impact sockets. 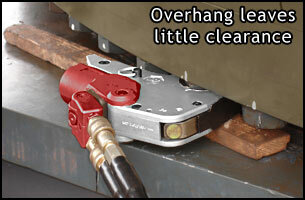 This small radius allows the tool access to tight spaces. However any Reducer will INCREASE that nose radius by the thickness of the Redusers wall. The reducers is held in place with a retainer-ring and secured with a grub screw. (see pics left). NOTE: When using Reducers check the radius clearance is still wide enough to allow the Hex Low Profile to fit on. Remember when using a Reducer Insert the nose radius is INCREASED, thus you need MORE space for the tool to fit.